Spring-ws API works on the principal of contract first SOAP webservice. In this type of webservice implementation the wsdl is created first. 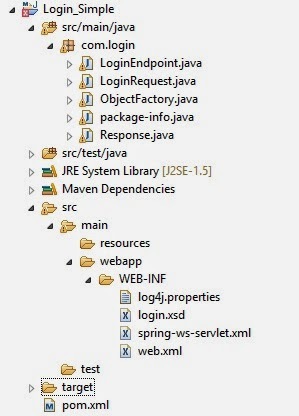 In contract last SOAP webservice the JAVA code is created first which inturns creates the wsdl. The contract first webservice is a bit difficult to implement as compared to contract last webservice as the xsd and wsdl needs to be created manually. Contract first webservice is more advantageous though as it eliminates the impedance mismatch problem. Below code snippets explains how to use spring-ws to implement the SOAP based webservice. The first thing to do is to identify the request and response xml and to create the XSD. The xsd can be created using any online tools. Since Spring-ws is a contract first API we have to come up with the xsd. The XSD will be used to generate the wsdl in later sections. The next thing is to create the web.xml file. Above here MessageDispatcherServlet is defined which is the entry point of the SOAP webservice. As in Spring MVC the servlet looks for spring-ws-servlet.xml file. This file below dynamic-wsdl tag which uses the xsd to create the wsdl. Also 2 interceptors are mentioned. One to validate the request/response messages and the other one to print the request/response on console. Next is to create the request and response classes. This can be done by using the xjc command in JAVA_HOME\bin folder. What it needs is just the xsd. Go to the folder where the xsd is saved and type the below command. Now finally we create the endpoint class. The actual webservice. This class used JAXB marshaller to marshall and unmarshall the request/response objects. Once the services is UP, you can test the webservice using any webservice client like jax-ws or any other tool.